Mei Ling means "beautiful flower," and she is! Festive ornaments fasten her long, black hair. She's dressed in a richly embroidered silk dress of red and gold. Almond-shaped brown eyes sparkling, she's ready to celebrate! 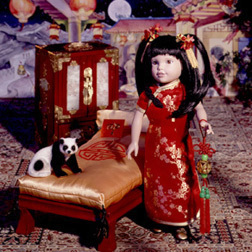 14"T.
Mei Ling was introduced late in 1997, after the first 11 dolls (along with Gretchen).